For a long while, I’ve wanted to do a project featuring the art of native Southwesterners. The indigenous peoples in (now called) Arizona have created dazzlingly beautiful works. As a child in Tucson, I grew up surrounded by these artifacts, and my appreciation has grown over the years. Now I’m activating this appreciation into a project. Here are the first four of a series of (I think) about twenty baskets. These were woven by members of the Tohono O’odhom Nation. The baskets range in size and are quite shallow, which makes it hard to show their depth. It’s all a learning process. 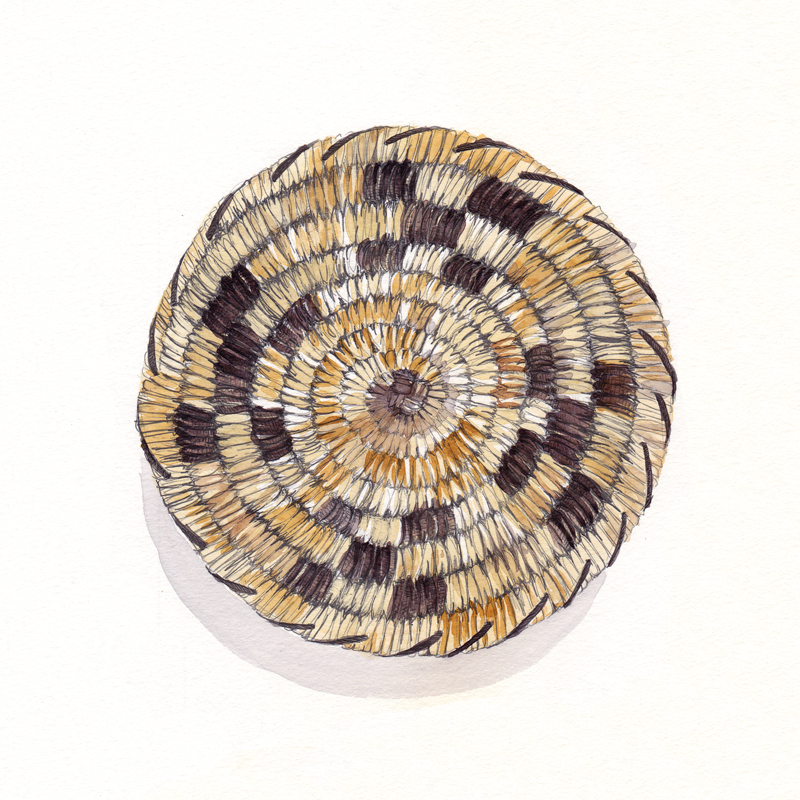 Trefoil Basket, pencil & watercolor. 6-Point Star Basket, pencil & watercolor. 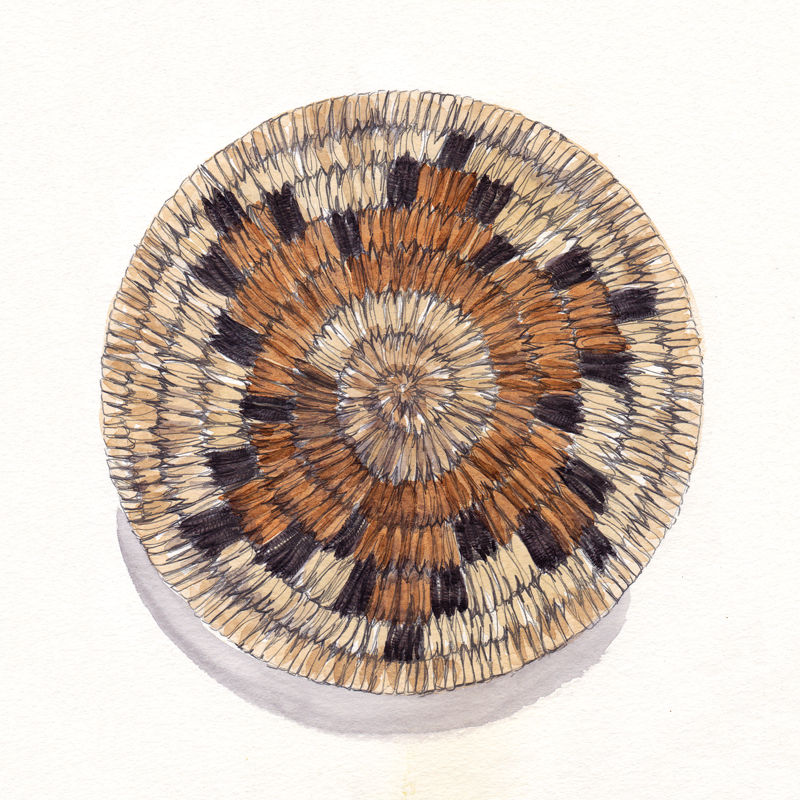 Four-Diamond Basket, pencil & watercolor. 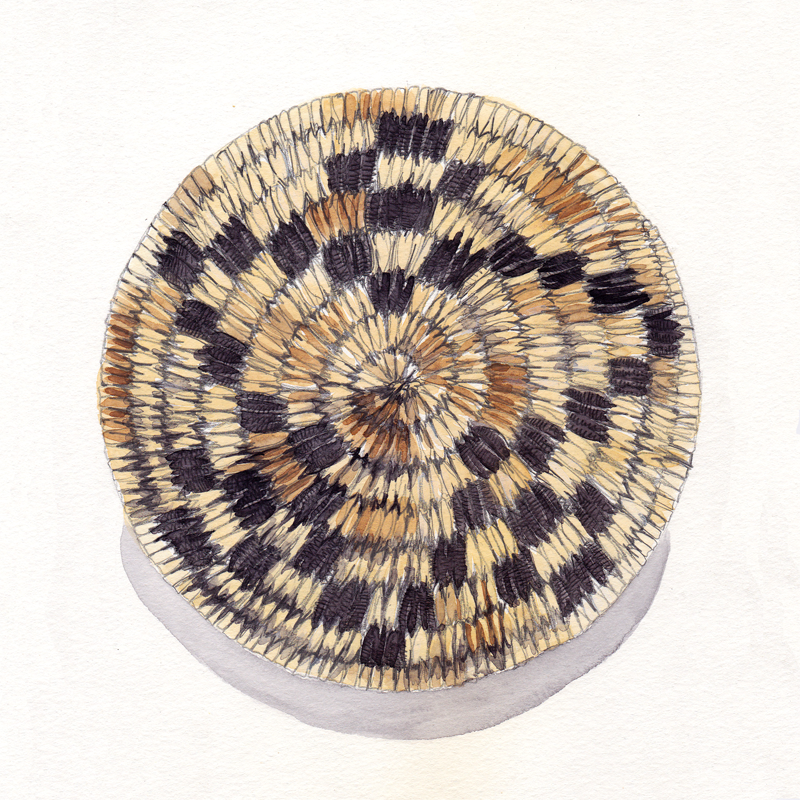 Checkerboard Basket, pencil & watercolor. I’ve had some people ask how these are drawn; it’s a pretty basic drawing and painting process with pencil and watercolor. The secret sauce is observation. 1. Start with direct observation. There’s no substitute for this! First thing I do is look deeply at the basket…how was it made? What holds it together? What is it made of? What does it feel like? What interesting or distinctive lines or shapes are there? I turn it over and around, measure it, make notes and really work to understand it. Informational sketches are key at this stage…I don’t start the final drawing until I think I really “get” the basket. I don’t live in Arizona any more, which means I do most of the final painting later. So I take reference photos and use them and my notes in the final work. Direct observation and notes are key. 2. Sketch the schematic. Since I’m terrible at freehand drawing circles, I use a template (aka: trace a plate), then measure to the center and draw an axis at each mid-point. Then, counting the number of rounds in the basket, I segment the axis into the correct number of whorls/rounds. Starting at the centerpoint, I lightly sketch the rounds. The first few times I also added the pattern at this stage (you can see that below,) but learned it was more accurate if I added the pattern later in the process. The initial schematic, with accurate number of rounds. 3. Pencil in the strands. 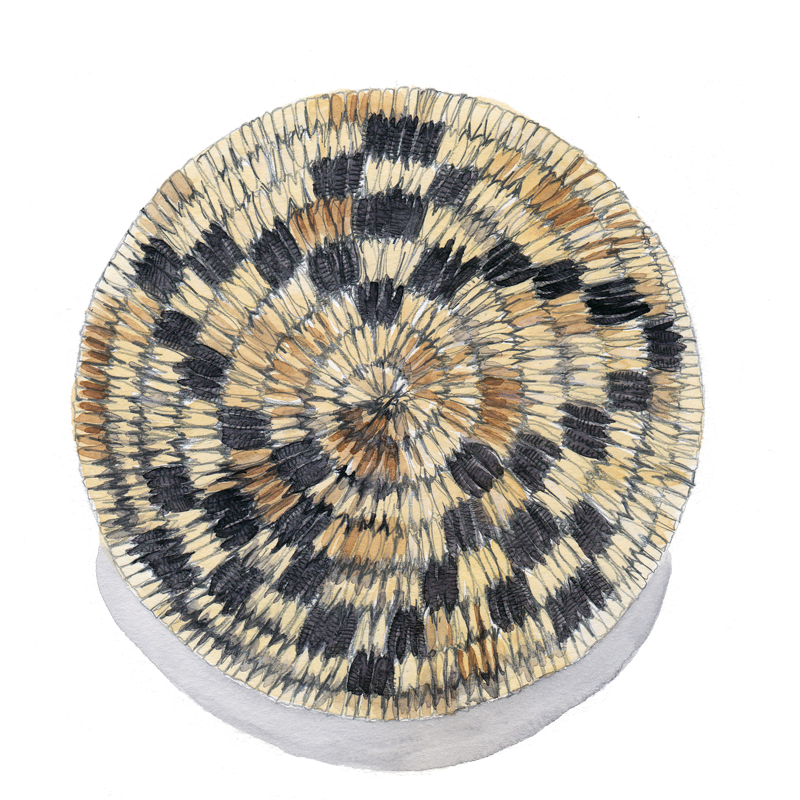 The baskets are formed by sewing a covering strand made of yucca around a coiled element. 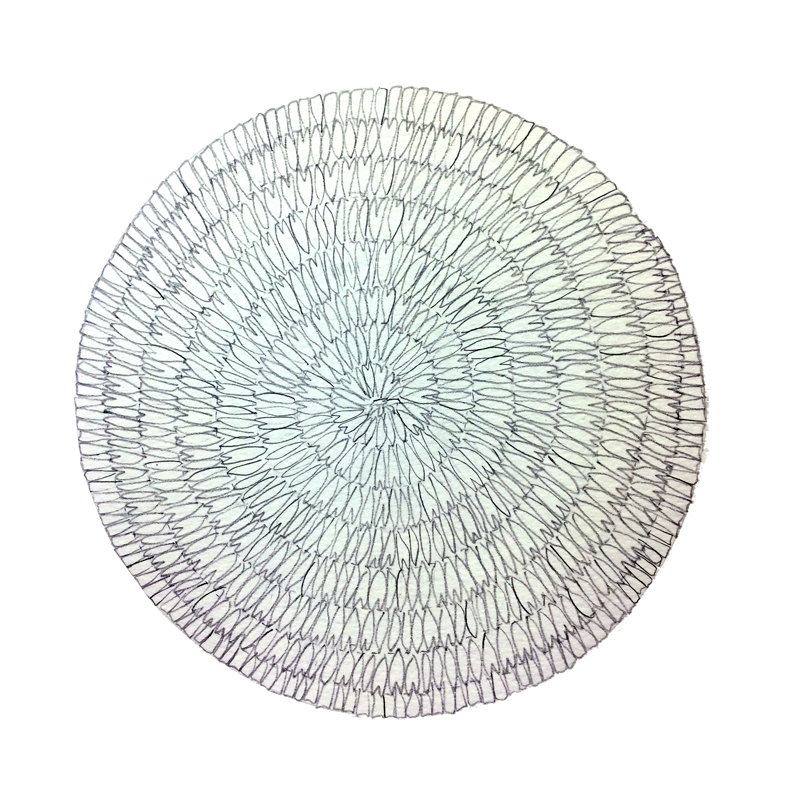 As a result, each strand has a piercemark which creates a zig-zag edge to each round. (This is the kind of insight you get with direct observation.) 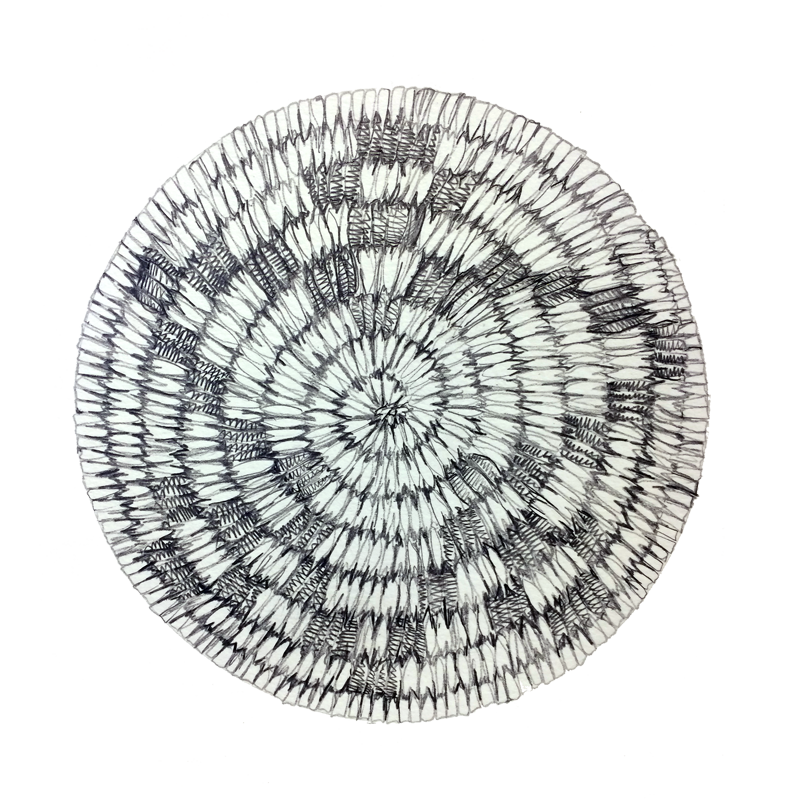 Sketching the shape of each strand creates the woven feeling and gives the piece the needed complexity. I start in the center, and erase the schematic lines as the coils are filled in. This process is, shall we say…meditative. It’s important to have different shapes, in slightly different sizes, but still have an overall consistency. Keeping things randomized takes some attention. It’s a restful way to spend ~30 minutes. Adding contrast and connecting the coils gives the basket its rough material quality and creates the characteristic zig-zag joins of the coils. 5. Draw in the pattern. 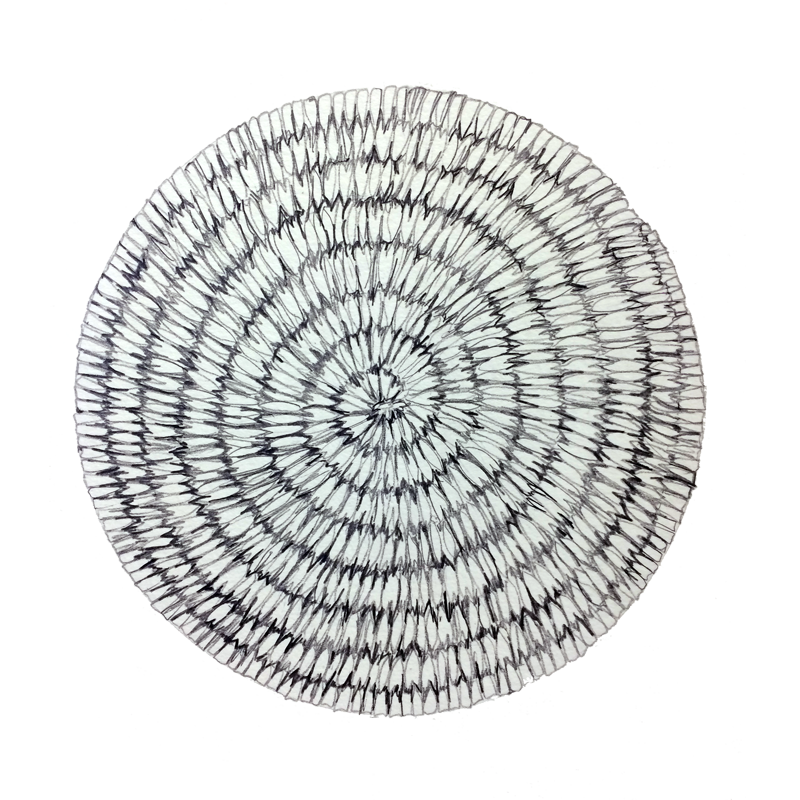 Counting carefully, I start from the center and darken the strands that carry the main pattern. 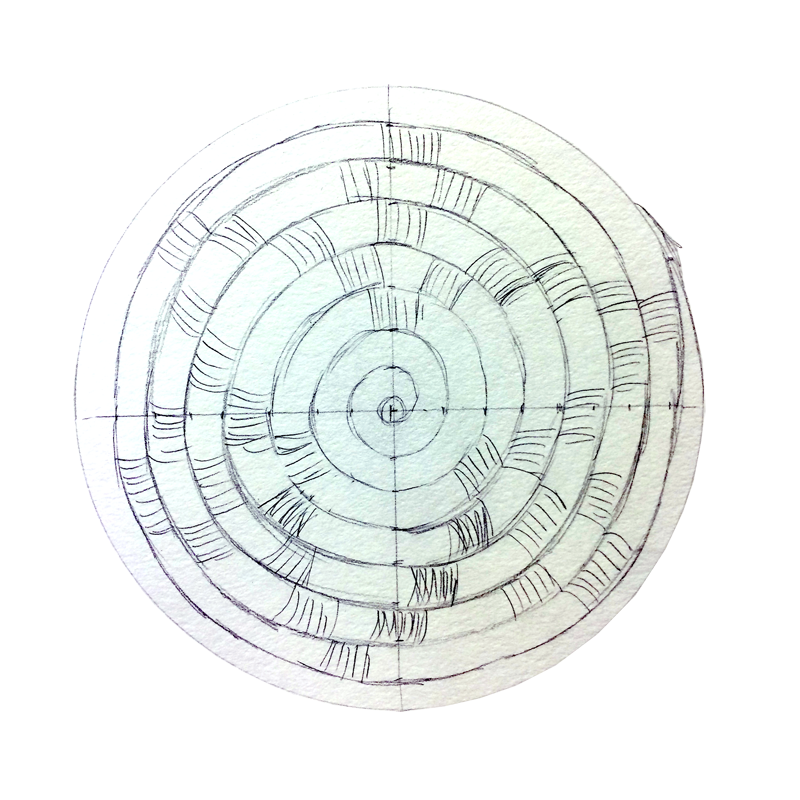 Although counting coils is important, it’s crucial to also step back and make sure the overall pattern is true…the balance of the pattern around the entire basket must be accurate. Add the pattern by darkening selected strands. 6. Add color in layers. This series is pencil and watercolor. Starting with the lightest maize/yellow tone, I glaze the entire piece, leaving some whites for sparkle. Then I add successively darker colors, finishing with the deepest brown/black for the pattern. Depending on the specific basket, I might use 4-6 shades of color for the light areas, 2-3 for the medium areas and 1-2 for the darkest areas. The last step is to punch in the darkest blacks usually in the pierced coil areas so that the strands maintain a sense of depth and shadow, and add a shadow under the whole basket. Color brings the materials to life and highlights the graphic artistry of the woven pattern. This basket painting is 6.5″ x 7″, and took a total of 1 hour, 20 minutes to finish. 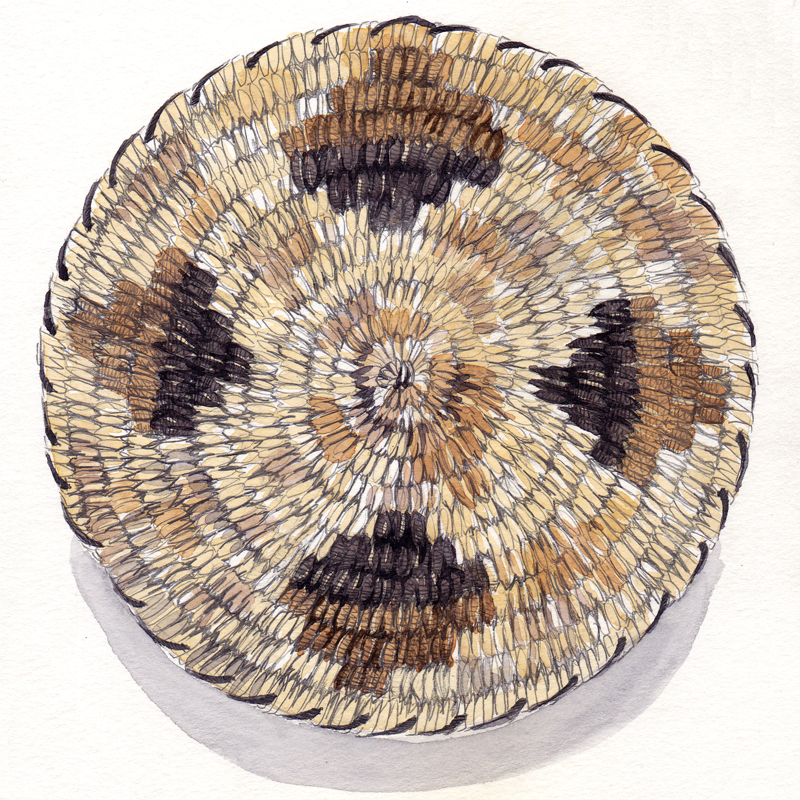 I’m on the lookout for other resources on painting baskets, and also seeking information on how to identify traditional Tohono O’odham basket patterns. If you have info to share, please post a comment.